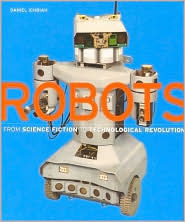 Robots of all shapes, forms and functions are presented in this comprehensive but difficult-to-read work, which traces the evolution of robots-from the hydro-powered automatons of the Renaissance and the automatic looms of the 18th century to the self-guided vacuum cleaners, space explorers and artificial pets of today. The book is organized loosely by topic (Robots in Fiction, Robots in Industry, etc.) and embellished with numerous interviews with writers, inventors and even people who perform plays with robots. Though just about every kind of robot-either in reality or in imagination-receives its due, this coffee-table tome has many drawbacks. Some of the most interesting full-color pictures are put forth with little or no discussion of the portrayed creation, and the translation sometimes results in awkward passages and phrasings. In addition, much of the text and pictures do not stand on their own, which makes browsing difficult. Overall, while the information found here is varied and often intriguing, the book's unfortunate organization greatly detracts from one's enjoyment of it. 1,500 color illustrations.